I was particularly pleased to see this study appear in the top-tier journal, Nature. (Thanks to my colleague Sarah Vieweg for flagging). Earlier studies have shown that “human communications are both temporally & spatially localized following the onset of emergencies, indicating that social propagation is a primary means to propagate situational awareness.” In this new study, the authors analyze crisis events using country-wide mobile phone data. To this end, they also analyze the communication patterns of mobile phone users outside the affected area. So the question driving this study is this: how do the communication patterns of non-affected mobile phone users differ from those affected? Why ask this question? Understanding the communication patterns of mobile phone users outside the affected areas sheds light on how situational awareness spreads during disasters. 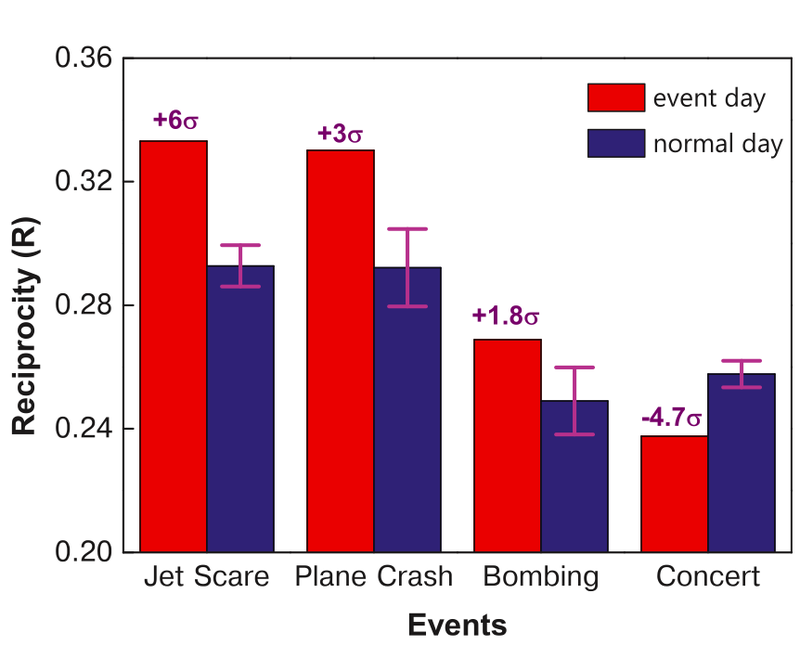 The graphs above (click to enlarge) simply depict the change in call volume for three crisis events and one non-emergency event for the two types of mobile phone users. The set of users directly affected by a crisis is labeled G0 while users they contact during the emergency are labeled G1. Note that G1 users are not affected by the crisis. Since the study seeks to assess how G1 users change their communication patterns following a crisis, one logical question is this: do the call volume of G1 users increase like those of G0 users? The graphs above reveal that G1 and G0 users have instantaneous and corresponding spikes for crisis events. This is not the case for the non-emergency event. 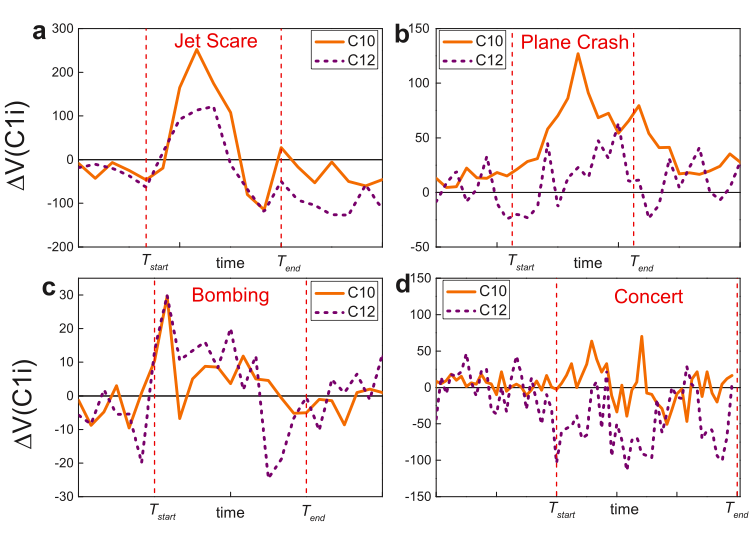 “As the activity spikes for G0 users for emergency events are both temporally and spatially localized, the communication of G1 users becomes the most important means of spreading situational awareness.” To quantify the reach of situational awareness, the authors study the communication patterns of G1 users after they receive a call or SMS from the affected set of G0 users. They find 3 types of communication patterns for G1 users, as depicted below (click to enlarge). 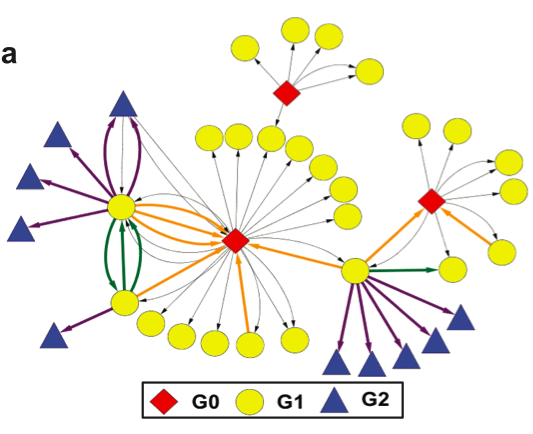 Pattern 1: G1 users call back G0 users (orange edges). Pattern 2: G1 users call forward to G2 users (purple edges). Pattern 3: G1 users call other G1 users (green edges). Which of these 3 patterns is most pronounced during a crisis? Pattern 1, call backs, constitute 25% of all G1 communication responses. Pattern 2, call forwards, constitutes 70% of communications. Pattern 3, calls between G1 users only represents 5% of all communications. 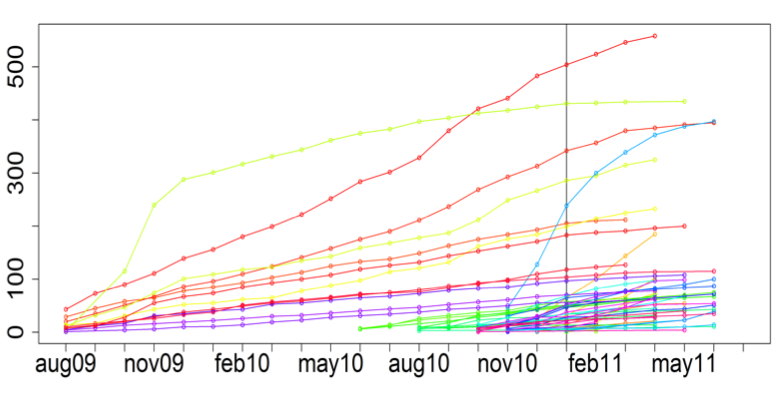 This means that the spikes in call volumes shown in the above graphs is overwhelmingly driven by Patterns 1 and 2: call backs and call forwards. The histogram below shows average levels of reciprocal communication for the 4 events under study. These results clearly show a spike in reciprocal behavior for the three crisis events compared to the baseline. The opposite is true for the non-emergency event. In sum, a crisis early warning system based on communication patterns should seek to monitor changes in the following two indicators: (1) Volume of Call Backs; and (2) Deviation of Call Backs from baseline. Given that access to mobile phone data is near-impossible for the vast majority of academics and humanitarian professionals, one question worth exploring is whether similar communication dynamics can be observed on social networks like Twitter and Facebook. Can Official Disaster Response Apps Compete with Twitter? There are over half-a-billion Twitter users, with an average of 135,000 new users signing up on a daily basis (1). Can emergency management and disaster response organizations win over some Twitter users by convincing them to use their apps in addition to Twitter? For example, will FEMA’s smartphone app gain as much “market share”? The app’s new crowdsourcing feature, “Disaster Reporter,” allows users to submit geo-tagged disaster-related images, which are then added to a public crisis map. So the question is, will more images be captured via FEMA’s app or from Twitter users posting Instagram pictures? This question is perhaps poorly stated. While FEMA may not get millions of users to share disaster-related pictures via their app, it is absolutely critical for disaster response organizations to explicitly solicit crisis information from the crowd. See my blog post “Social Media for Emergency Management: Question of Supply and Demand” for more information on the importance demand-driven crowdsourcing. The advantage of soliciting crisis information from a smartphone app is that the sourced information is structured and thus easily machine readable. For example, the pictures taken with FEMA’s app are automatically geo-tagged, which means they can be automatically mapped if need be. While many, many more picture may be posted on Twitter, these may be more difficult to map. The vast majority of tweets are not geo-tagged, which means more sophisticated computational solutions are necessary. Instagram pictures are geo-tagged, but this information is not publicly available. So smartphone apps are a good way to overcome these challenges. But we shouldn’t overlook the value of pictures shared on Twitter. Many can be geo-tagged, as demonstrated by the Digital Humanitarian Network’s efforts in response to Typhoon Pablo. More-over, about 40% of pictures shared on Twitter in the immediate aftermath of the Oklahoma Tornado had geographic data. In other words, while the FEMA app may have 10,000 users who submit a picture during a disaster, Twitter may have 100,000 users posting pictures. And while only 40% of the latter pictures may be geo-tagged, this would still mean 40,000 pictures compared to FEMA’s 10,000. Recall that over half-a-million Instagram pictures were posted during Hurricane Sandy alone. The main point, however, is that FEMA could also solicit pictures via Twitter and ask eyewitnesses to simply geo-tag their tweets during disasters. They could also speak with Instagram and perhaps ask them to share geo-tag data for solicited images. These strategies would render tweets and pictures machine-readable and thus automatically mappable, just like the pictures coming from FEMA’s app. In sum, the key issue here is one of policy and the best solution is to leverage multiple platforms to crowdsource crisis information. The technical challenge is how to deal with the high volume of pictures shared in real-time across multiple platforms. This is where microtasking comes in and why MicroMappers is being developed. For tweets and images that do not contain automatically geo-tagged data, MicroMappers has a microtasking app specifically developed to crowd-source the manual tagging of images. In sum, there are trade-offs. The good news is that we don’t have to choose one solution over the other; they are complementary. We can leverage both a dedicated smartphone app and very popular social media platforms like Twitter and Facebook to crowdsource the collection of crisis information. Either way, a demand-driven approach to soliciting relevant information will work best, both for smartphone apps and social media platforms. How we feel about the content we read on Twitter influences whether we accept and share it—particularly during disasters. My colleague Yasuaki Sakamoto at the Stevens Institute of Technology (SIT) and his PhD students analyzed this dyna-mic more closely in this recent study entitled “Perspective Matters: Sharing of Crisis Information in Social Media”. Using a series behavioral psychology experiments, they examined “how individuals share information related to the 9.0 magnitude earthquake, which hit northeastern Japan on March 11th, 2011.” Their results indicate that individuals were more likely to share crisis infor-mation (1) when they imagined that they were close to the disaster center, (2) when they were thinking about themselves, and (3) when they experienced negative emotions as a result of reading the information. 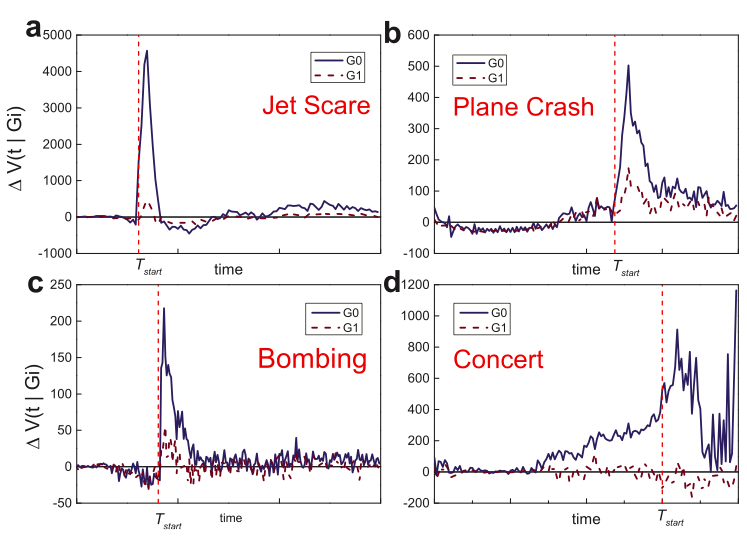 To test these hypotheses, Yasu and company collected one year’s worth of tweets posted by two major news agencies and five individuals following the Japan Earthquake on March 11, 2012. They randomly sampled 100 media tweets and 100 tweets produced by individuals, resulting a combined sample of 200 tweets. Sampling from these two sources (media vs user-generated) enables Yasu and team to test whether people treat the resulting content differently. Next, they recruited 468 volunteers from Amazon’s Mechanical Turk and paid them a nominal fee for their participation in a series of three behavioral psychology experiments. In the first experiment, the “control” condition, volunteers read through the list of tweets and simply rated the likelihood of sharing a given tweet. The second experiment asked volunteers to read through the list and imagine they were in Fukushima. They were then asked to document their feelings and rate whether they would pass along a given message. Experiment three introduced a hypo-thetical person John based in Fukushima and prompted users to describe how each tweet might make John feel and rate whether they would share the tweet. The results of these experiments suggest that, “people are more likely to spread crisis information when they think about themselves in the disaster situation. During disasters, then, one recommendation we can give to citizens would be to think about others instead of self, and think about others who are not in the disaster center. 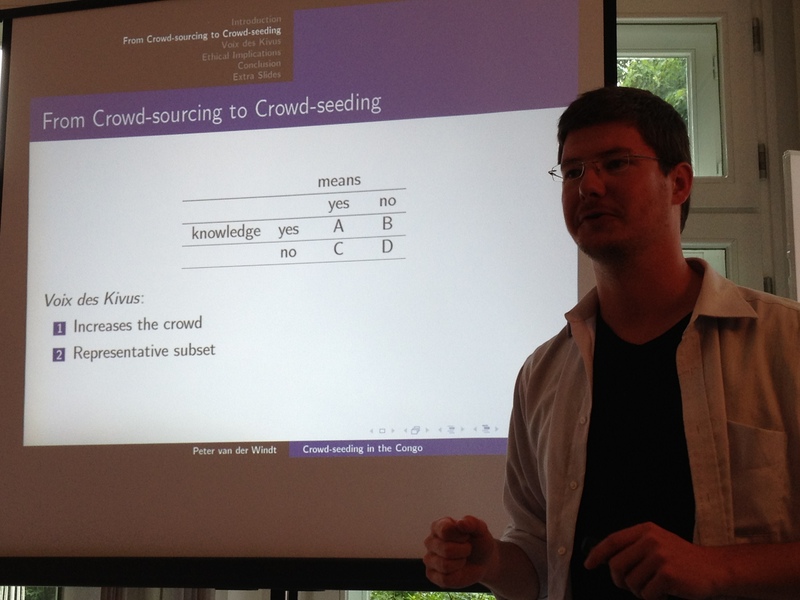 Doing so might allow citizens to perceive the information in a different way, and reduce the likelihood of impulsively spreading any seemingly useful but false information.” Yasu and his students also found that “people are more likely to share information associated with negative feelings.” Since rumors tend to evoke negativity,” they spread more quickly. 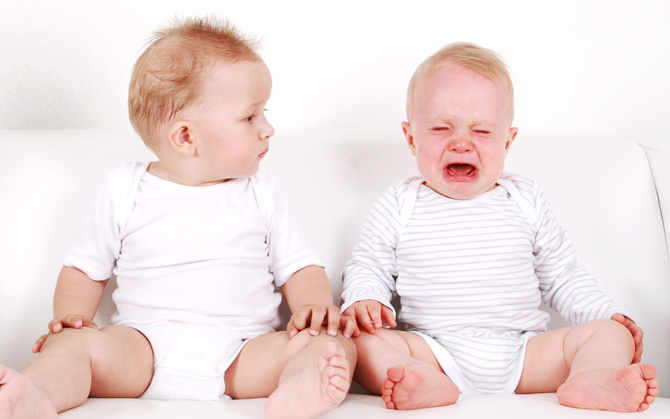 The authors entertain possible ways to manage this problem such as “surrounding negative messages with positive ones,” for example. I’ve been using Rapportive for several few weeks now and have found the tool rather useful for assessing the trustworthiness of a source. Rapportive is an extension for Gmail that allows you to automatically visualize an email sender’s complete profile information right inside your inbox. So now, when receiving emails from strangers, I can immediately see their profile picture, short bio, twitter handle (including latest tweets), links to their Facebook page, Google+ account, LinkedIn profile, blog, SkypeID, recent pictures they’ve posted, etc. As explained in my blog posts on information forensics, this type of meta-data can be particularly useful when assessing the importance or credibility of a source. To be sure, having a source’s entire digital footprint on hand can be quite revealing (as marketers know full well). 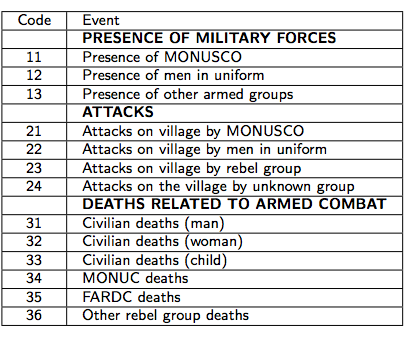 Moreover, this type of meta-data was exactly what the Standby Volunteer Task Force was manually looking for when they sought to verify the identify of volunteers during the Libya Crisis Map project with the UN last year. Obviously, the use of Rapportive alone is not a silver bullet to fully determine the credibility of a source or the authenticity of a source’s identity. But it does add contextual information that can make a difference when seeking to better under-stand the reliability of an email. 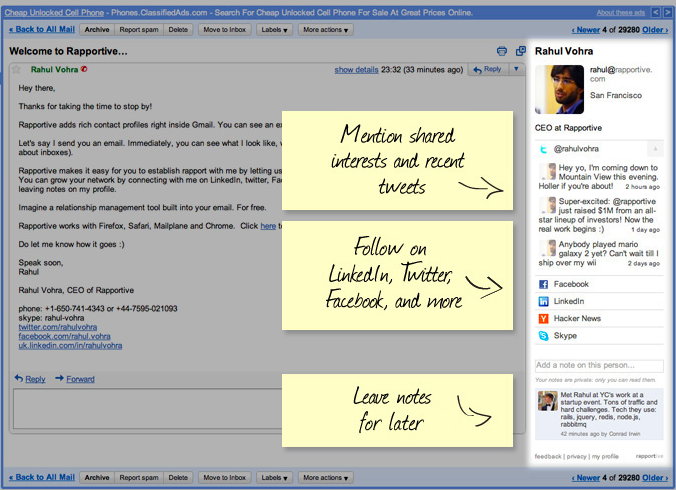 I’d be curious to know whether Rapportive will be available as a stand-alone platform in the future so it can be used outside of Gmail. A simple web-based search box that allows one to search by email address, twitter handle, etc., with the result being a structured profile of that individual’s entire digital footprint. Anyone know whether similar platforms already exist? They could serve as ideal plugins for platforms like CrisisTracker.